Neta Jackson's testimony, "I grew up in a wonderful Christian home in Seattle, Washington, where I was steeped in the Bible and gave my heart to Jesus at an early age (like 4!). My parents were involved in Christian schools, my dad as a principal and my mother as the librarian, so I grew up very sheltered. I was later baptised at 16,, attended a Bible school, then a Christian college--but all that was a foundation, not the journey. Much of what I knew about Scripture and following Jesus was through the lens of a white, middle class, American, sheltered upbringing. Then . . . God shook me up and put me in situations in my adult life that were not white, not middle class, not sheltered. My only anchor was God's Word and a Bible study group of women from different races and cultures that commited ourselves to study the Word and pray for one another. But as I related to sisters from other church traditions and cultures, other life situations, coming out of difficulties I'd never imagined, much less faced in my life, I discovered God is a great big God and works in mighty ways. Scripture came alive as never before, and I discovered I need---yes, need---all the different parts of the Body of Christ (1 Cor. 12). "I was speaking at a women's retreat recently, and a white-haired lady with a background similar to mine said: "I've believed in God all my life, but only recently have I begun to believe God." Whew! I wept as the truth of that in my own life sank in. Do I truly believe the promises of God, that God will do what He says He will do? That I have the authority to pray in the name of Jesus so that things change, people are healed, the devil is bound? Whew . . . I'm just hanging on for the ride. "One of the wonderful gifts growing out of this journey for me has been learning about different forms of worship (several of which I've shared in my Yada Yada novels), and the power of praise and worship in my personal life to thwart the enemy. Praise and worship are not Satan's working conditions!--he trives in an atmosphere of doubt, fear, anxiety, self-centeredness, busyness, distraction etc.). In the past two decades, God has led my husband and me to invest ourselves in multi-cultural churches where we've learned such freedom in worship. We are currently members of The Chicago Tabernacle, a daughter church of The Brooklyn Tabernacle in New York (a.k.a. The Brooklyn Tabernacle Choir). The church members span many cultures, including a majority of Spanish speaking members, which is new for me. (And I had to take French in college, oy vey!) I'm so grateful God has shown me the beauty of His Body and how much God longs for us to live and work together in unity." To learn more go to the Jackson web site www.daveneta.com and click on "About Us." Neta Jackson Neta Jackson's award-winning Yada books have sold more than 350,000 copies and are spawning prayer groups across the country. She and her husband, Dave, are also an award-winning husband/wife writing team, best known for the Trailblazer Books--a 40-volume series of historical fiction about great Christian heroes with 1.8 million in sales--and Hero Tales: A Family Treasury of True Stories from the Lives of Christian Heroes (vols 1-4). Dave and Neta live in Evanston, Illinois, where for twenty-seven years they were part of Reba Place Church, a Christian church community. They are now members of the Chicago Tabernacle, a multi-racial congregation that is a daughter church of the well-known Brooklyn Tabernacle. Turkey dinners, tree trimming, and decking the halls--it's that time of year again! And I Jodi Baxter, can't wait to celebrate. My kids are coming home for Thanksgiving and Christmas, and then all of us Yadas are getting decked out for a big New Year's party. But God's idea of "decked out" might just change the nature of our party plans. A perplexing encounter with a former student, a crime that literally knocks me off my feet, a hurry-up wedding, and a child who will forever change our family...it's times like these that I really need my prayer sisters. This holiday season, we Yada Yadas are learning that no one can out celebrate God. So let's get this party started! 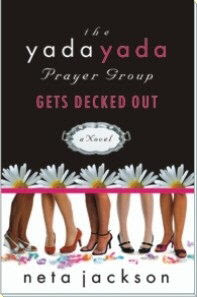 THE YADA YADA PRAYER GROUP GETS DECKED OUT is a festive novella featuring America's favorite prayer group, the Yada Yadas! Sometimes dubbed "chick-lit" for their bright covers and catchy titles, this series provides far more depth than witty banter and wacky situations. Inspired by a prayer group of real women, each book will have you laughing, crying, and perhaps praying anew. In this highly anticipated installment, the Yada Yada sisters-a group of multi-cultural friends-and their families prepare for the event of the season. But yes, eager readers, this novella—which picks up a year and a half after the end of book #6 The Yada Yada Prayer Group Gets Rolling concludes the series with some twists and turns that will amaze and encourage you. Plus, it sets the stage for Neta’s new series with new characters and new situations but also occasional roles for the beloved Yada Yada sisters in familiar Chicago neighborhoods with all their cultural richness.